For those who love… A taste of mushrooms! Here's a fantastic gift for those who love mushrooms! In this package you will find a mix of products that will let you taste them in a lot of different ways. You'll be able to try: Mushroom 250g from Azienda Agricola Belvedere; Porcini Mushrooms Sauce 200g fom La Dispensa di Amerigo; Mushrooms in Extra Virgin Olive Oil from Masseria Mirogallo, Dried Porcini Mushrooms 20g from Urbani, Mushroom Mix with Porcini Mushrooms 200g from Sottobosco Valtaro, Porcini Mushrooms Risotto 250g from Azienda Agricola Belvedere. 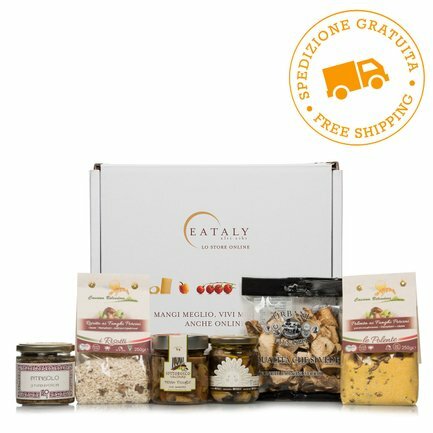 Take advantage of the free shipping to give someone or give yourself a mix of delicious mushroom-based products. Ingredients Funghi Porcini Secchi 20g:Dried Fruit Sliced ​​Mushrooms (Boletus Edulis and its group). Porcini Mushroom Risotto 250g:carnaroli rice 91%, porcini mushrooms 3.2% (Boletus edulis), natural sea salt, rice flour, onion, celery, carrot, parsley, extra virgin olive oil, garlic, maize starch, miso (soya, rice, water, salt, koji), yeast extract, spices. 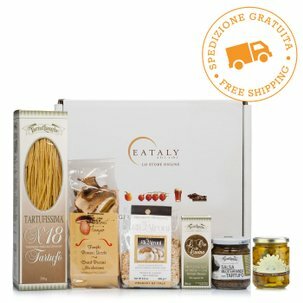 This box contains: Azienda Agricola Belvedere, La Dispensa di Amerigo, Masto kit Eataly ha scelto:seria Mirogallo, Urbani, Sottobosco Valtaro.